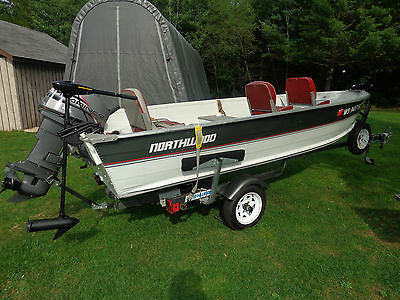 1989 14' Northwood V Bottom Fishing BoatUp for auction is my 1989 14' Northwood V Bottom fishing boat with a 25 HP Mariner Short Shaft motor. Also included is a 36lb Thrust Minnkota trolling motor.Boat...Has 3 swivel seatsCarpeted flat floorSmall live wellSmall storage area (which is where I relocated the battery)4 Rod holders2 Anchor Mates w/ 18lb anchorsTransom SaverExide Nautilis deep cycle battery (purchased new May 2014)Lowrance X4 Pro fish locator36lb Thrust Minnkota trolling motorEngine...1997 25 HP Mariner Short Shaft EnginePull startCarburetedHas adjustable idleEngine can be set for shallow drive (nice feature)Serial #0G564605Trailer...Northwoods roller trailerSide guidesLED lightsNew tires (May 2014)New wheel bearings with bearing buddies (May 2014)Spare tire carrier w/spareNewer winch w/strapNewer Jack StandOverall... This boat is in very good condition for its age and is ready to hit the water. It needs no work. It is a great family fishing boat that we just don't have time to use any more. Boat does have scratches on it (as expected for something this age) but otherwise very clean and well kept. Engine runs great! We are only the second owners of this boat. Carpet is in good shape but some what faded from sun. Previous owners along with us kept boat covered and in storage when not in use. I welcome any more questions or feel free to come see it in person. Just let me know. I can get more detailed pictures for you if needed.We are listing this locally also and reserve the right to end auction at any time. As with all my auctions, all sales are final. I am flexible with when buyer needs to have the boat picked up. I will work with you for your convenience.Thanks for looking and happy bidding!